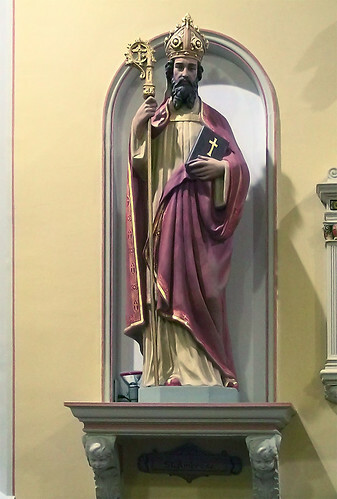 Statue of Saint Ambrose of Milan (ca. 340 - 397), "the Honey-Tongued Doctor" and "Hammer of the Arian Heretics", at Saint Ambrose Church, in Saint Louis. "Bind up your words that they run not riot, and grow wanton, and gather up sins for themselves in too much talking. Let them be rather confined, and held back within their own banks. An overflowing river quickly gathers mud. Bind up also your meaning; let it not be left slack and unchecked... Sobriety of mind has its reins, whereby it is directed and guided."